AKIPRESS.COM - One in three people living in Europe and Central Asia think corruption is one of the biggest problems facing their country, a Transparency International report said. This figure rises to two in three in Moldova, Spain and Kosovo, showing that urgent action against the abuse of power and secret deals is needed. Nearly a third of citizens across the region believe that their government officials and lawmakers are highly corrupt and a majority of people say their governments are not doing enough to stop corruption. Over half the people in European Union (EU) countries (53 per cent), EU accession candidate countries (53 per cent) and Commonwealth of Independent States (CIS), mainly former Soviet Union countries, (56 per cent) said their governments had failed to curb corruption. The governments of Ukraine (86 per cent), Moldova (84 per cent), Bosnia and Herzegovina (82 per cent), and Spain (80 per cent) were judged worst by their citizens. Transparency International spoke to nearly 60,000 citizens in 42 countries in Europe and Central Asia on their experiences with corruption in their daily lives for its new report People and Corruption: Europe and Central Asia, which is part of the Global Corruption Barometer 2016 series. 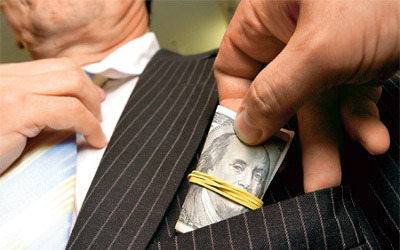 On average, one in six households paid a bribe when they accessed public services. Although fewer households paid bribes for public services in many EU member states, rates were significantly higher further east; the highest rates were in Tajikistan (50 per cent), Moldova (42 per cent), Azerbaijan, the Kyrgyz Republic and Ukraine (38 per cent), and Russia (34 per cent). Romania had the highest rate for an EU member state at 29 per cent, followed by Lithuania with 24 per cent. In the richest countries, almost two out of three people (65 per cent) believed the wealthy have too much influence on policy compared to 44 per cent in the EU accession countries and 46 per cent in CIS countries. In Spain, 88 per cent of people said wealthy individuals had undue influence over government decisions; in Portugal, it was 85 per cent, in France 79 per cent, in Germany and the UK 77 per cent. Yet one key stumbling block to fighting corruption is the lack of protection for those who speak up against it. 30 per cent of all those questioned across Europe and Central Asia said that the main reason more people don’t report cases of corruption is because they fear the consequences. Two out of five who blew the whistle suffered retaliation as a result. There is also a stigma attached to speaking out. Particularly in CIS countries, only a quarter of people think that reporting corruption was socially acceptable (27 per cent). Few citizens feel empowered to help stop corruption in their country: Less than half of people (47 per cent) in EU countries feel that they can make a difference in the fight against corruption, and this falls to less than a third (31 per cent) in CIS countries. Ensure the independence of the judiciary, particularly in EU accession and CIS countries, by reducing the influence of the executive over the judiciary and prosecutorial services and including transparent and objective systems for the appointment, transferral and dismissal of judges and prosecutors.